A perspective from Tracey Goodfriend, Account Director at Advantage – a sponsorship and brand experience agency. It’s almost impossible to avoid the buzz around the infamous failure that was the Fyre Festival. The 2017 event that never came to be turned an island in the Bahamas into a chaotic scene of unprepared workers and furious, stranded attendees. 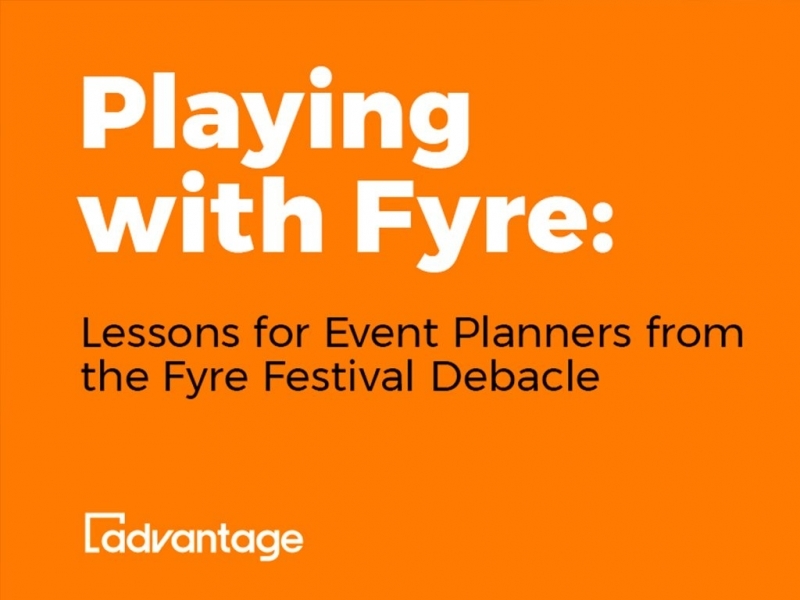 Although most observers are enjoying the pure entertainment value of the dueling documentaries on Netflix and Hulu, the endless memes, and the extensive cast of Instagram influencers dragged along for the ride, I’ve been enthralled with a whole other aspect: Fyre Festival as a master class in how NOT to plan an event. Never assume that something will just get done. “It always gets done” is a mantra not meant to be taken too literally; it takes a lot of hard work and management to pull events together. We have timelines, workback plans, deliverable trackers, status meetings and - the ultimate event planner tool - the mighty Run of Show, because our jobs are to make sure every single detail is executed accurately, on time, and on budget. Successful events are never the result of assuming someone is getting their job done. When you’re an organizer, it’s your job to ask questions – especially the tough ones – and make sure you have solid answers. Trust your resources, but also check in with them and make sure everyone agrees on deliverable dates, costs, etc. And if anything seems off, don’t be afraid to pause, regroup, and decide if you need to pivot. I’m really good at some things. The operative word here being SOME. I have no idea how to properly prepare Boeuf Bourguignon. Or run gas lines through residential housing to power a commercial kitchen. Or design a 3D rendering of an event activation. Instead, I have a network of experienced colleagues, partners, vendors, and trusted resources who are really good at those exact things, and endless amounts of other things that I don’t know how to do. I trust them to steer me in the right direction, keep my timelines on track, and tell me when I need to find alternate methods. And I know that I should leave the heavy lifting up to them for those deliverables - while checking in to make sure that the work is getting done (see item #1). I also know that while challenges are always exciting, certain challenges require bringing in people who know more than I do and can tell me what I should (or more importantly – shouldn’t) be doing. The reason you rely on 3rd parties to complete tasks is the same reason you should listen to those folks when they raise concerns. Successful events cannot be executed solely on blind ambition and wishful thinking. So much of what went wrong with the Fyre Festival was the result of the organizers hearing that things wouldn’t be ready, weren’t possible, or were a terrible idea, but not truly listening. Brands and event planners need to accept that trusted, informed experts will steer you in the right direction for your own good, even when the recommendations they’re giving you are not the answers that you want to hear. My clients and I are better in the end for trusting the experts. Not every great idea gets to see the light of day. In the world of event marketing, brilliant ideas are left on the table every day, sometimes halfway to execution and sometimes before they even get a chance to make it out of the concept phase. No one likes rejection or defeat, especially when what’s being defeated is your own creation. But when the potential failures and the liability of thousands of people hang in the balance, an old school cost benefit analysis can sometimes show you that the best solution is a change in course. When the risks so blatantly outweigh the potential rewards, it may be time to throw in the towel. Or at the very least…find a better island. Hopefully none of us are ever faced with a situation of Fyre’s magnitude, amplified by hundreds of Instagram influencers and a social media onslaught, but we can all take some important lessons from this to ensure that our events are thoughtful, well-planned, and prepared for anything that might pop up.